Suave has fresh new news, and it's not just about their fun fresh scents either! Suave has teamed up with none other than Wendy Williams to encourage us all to Unlock Your Softer Side. I love me some Wendy Williams. (HOW YOU DOIN', Wendy?) I'm a big fan of her talk show, and her edgy, tell-it-like-it-is attitude. That's why Suave partnered with Wendy in a mission to transform everything from her attitude to her skincare routine. Supplying ultimate hydration and leaving skin feeling fresh, Suave® will equip you with the essential tools for Unlocking your Softer Side with new, richer formulated products that provide 24-hour moisturization in a variety of fun, fresh scents all infused with natural ingredients. Suave and Wendy Williams have teamed up to help everyone “unlock their softer side”. 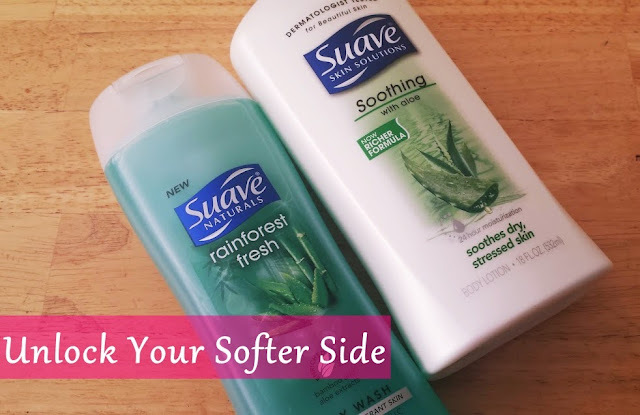 Visit Suave’s Facebook page to figure out your softness score and to check out Wendy’s tips and enter for a chance to win free products from Suave Skin Solutions Body Lotions and Suave Naturals Body Wash.